Can I be Green and a Fashion Lover? The short answer is maybe. Where is my fashion designed and manufactured? What types of safeguards are in place to minimize pollution in the creation process. Am I buying a pretty dress made in a not very pretty sweatshop employing humans who will never be able to afford this item and struggle to meet basic needs or was it made locally by independent artisans who determine their own working conditions? These are questions I want to ask at my favorite local boutique at home or when visiting another city. That brings me to another thought. I like to buy things made in the area where I am. I don’t want to buy made in China in Paris, I want to buy made in China in China. I like to buy southern California made swimwear as the designers and manufacturers understand my lifestyle and how that one piece may become my top later at dinner with a wrap and a skirt. My daughter bought me a beautiful cotton wrap while living in Thailand…they know sarongs. Am I willing to buy remanufactured? I am because the cutest jean jackets ever have been cobbled together from others with patches, embroidery, changed collars and yet they are timeless and add fun to any casual outfit. My favorite turquoise mules have been repaired more times than I can count but they still get compliments and fit better than ever. This photo taken with some phone that was still primarily a phone back when was taken in downtown SD after four hours of dancing at the EL D and walking back to my car parked a zillion blocks uphill away. My friend lent me one half of her flip flops she had in her purse should this need arise. The blue shoes have seen many a dance floor since as well and with the scalloped trim in light green they go with so many outfits. I haven’t had those jeans in years and the DJ from that night is big time in LA these days. What can you do? Feel free to comment with your ideas, experiences and thought on this topic. So I have been trying on clothes in order to determine what beloved items no longer fit (too big finally) and/or no longer suit my style. This task has taken on runway proportions as I combine and toss things together to see what makes a solid piece in an outfit. I found a black lace tee shirt whose back is now being sewn onto my zebra print sweater’s back. I embroidered over the neckline of a skritchy Prabal Guhrung tee shirt so that I may enjoy it with my turquoise corduroys this Spring. I discovered Miss Daisy the six month old Bulldogge has chewed the heels of my favorite yellow snakeskin heels. The Lilly Pulitzer corduroys two sizes too big will become a knee length skirt to be worn with the hot pink chiffon sleeveless top. The black sweater that never looked right on me is heading for the Hera Hub clothes swap to benefit The Monarch school of San Diego and Planned Parenthood. Also the Levis I gladly relinquish to another with the beginnings of holes in them they are at their prime. The shrug sweater that was not my style will also find a happy new wearer. I realize I really like skirts over jeans or slacks. I have a pretty good collection of nice skirts gathered from other’s closets, thrift stores, local designer’s wares to wear and even a few purchased by my mother. So I will try each on and be willing to share my overstock with my skirt wearing sisters at Hera. I have enjoyed this wardrobe overhaul and all it means to me in my life which is in a constant state of overhaul. Sorting out what works from what doesn’t is always the trick. It isn’t about the fashion but rather your personal style. Wear what makes you look good and feel good. If it means breaking out your Nancy Reagan red dress and rocking it with your vintage candies go for it if works for you. I have noticed over the years the only people who look awkward in fashion that stands out are the ones who are forcing a look that is incongruent with their inner fashionista. In the eighth grade I had a red corduroy Eisenhower style jacket and matching wide legged pants with high waist AND cuffs. Some kids giggled and made fun while a few edgy fashionistas whose father’s let them shop in New York and Paris understood my statement. I had that jacket many years after the pants were sent on to fashionista recycle. I wish I had it today! I currently own a jean jacket and a corduroy jacket so maybe that means I’m greedy, or just prepared as I have loaned the corduroy jacket out many a time to friends. I should slip a library card in the pocket for check out! I have refrained from ornamenting it as the jean jacket has a variety of after market trims and embellishments on it. Back when I still wore suede slacks I had these to wear with my Lady Diana Blue silk blouse. 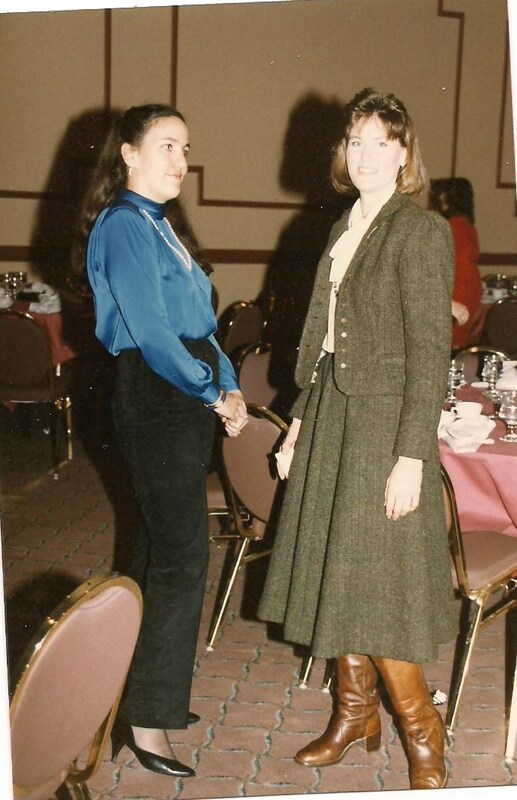 Many thought I was out there wearing these together I thought I rocked it…I still think that : ) Yes that is me looking quite conservative in my pearls at the Women’s Opportunity Week Fashion show with talented clothing designer Tawny Walkowiak. Tawny made the delicious suit she is wearing. So back to editing my wardrobe and my life…add, take away, alter to fit, repeat. A couple of years ago I gave up wearing stilettos because I argued (with myself) I was in a different age now and should be enjoying all that earthy-fel like nothing shoes could offer…except fashion. 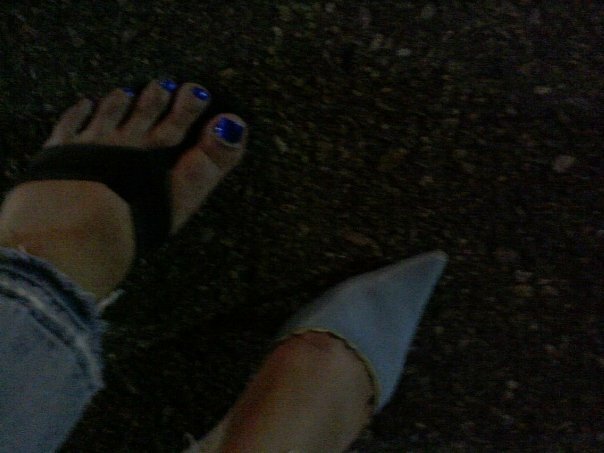 I kept a few pair but just as reminders of a sexier time when I was given the SD once over as I would stroll in my snakeskin stiletto sandals. I remembered those days fondly as I shoved my pie hole full of bread and ice cream and pasta. Hmmmm maybe there is a relationship here? So I began this past autumn a plan to detox, rearrange my thinking about what is actually food and step up my workouts. Funny thing happened…as I cleaned my diet and detoxed with ionic and far infrared saunas I was becoming very strong…except the days after I had enjoyed wheat products. On those days I was suffering from ever more serious asthma and anaphylaxis after my workouts. I recognized this as a side effect of cleansing my system of the evil years in which I allowed some very “foods” pass my lips. I was also making the connection between my consumption of wheat as well as dairy. The casein was making the asthma worse on some days. 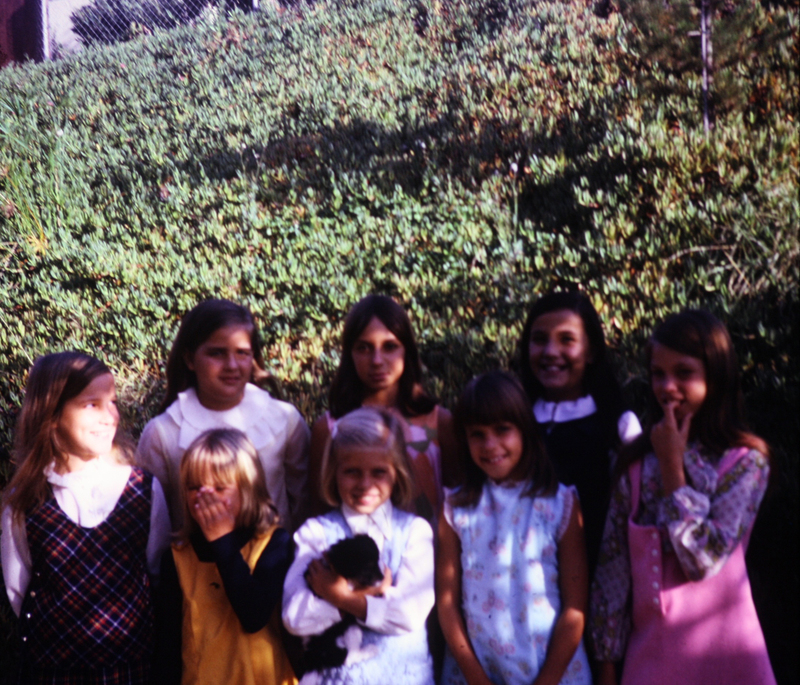 I am not the happy 10 year old in the photo (back row right in the ruffly white blouse under the navy blue suit). Back then I ran the canyons with my pals, ate berries and oranges and pomegranates growing in my neighborhood. My mom never bought junk food and soda was seen in machines at gas stations but rarely consumed. As I grew older and my allergies took on a life all their own I learned that certain foods actually made me sick. namely many on the school lunch menu ugghh. This past couple of years had coincided with weight gain, muscle loss and energy loss. I was poopy tired all the time and never woke up fully refreshed all while being hungry as a bear! I now know that is my body not receiving enough nutrients and so it makes me hungry. In the meantime the errant molds, fungus etc were telling me to eat sugar and lots of it! It was as if an alien predator had invaded my ever expanding body. Today I eat lots of raw organic and some paleo meals where I find I enjoy the flavors of fish and chicken and meat but I need a whole lot less to feel satisfied. I am a fruit junkie these days and try to keep food nearby to graze. So you can see I am wearing heels and a local designer Stacie May’s dress along with my own ESG design necklace. When I put on my favorite outfits these days I smile remembering nothing tastes as good as fit feels! A vous sante! Fashion is often dismissed as part of a lifestyle which is offensive to those who toil in sweatshops and cannot afford those very items they create. I propose a different vision. Fashion is at the basis of our daily communication with our world professionally and personally. By creating and manufacturing, distributing and selling all within a region realigns our economy to our lifestyles and wages. I’m suggesting something as basic as a local sustainable economy reflective of the needs of San Diegans. The flip side of this coin is developing the top end resale business. A perfect compliment to buying locally manufactured clothes, jewelry, food etc. is the upcycle and reuse of those outside elements already in our midst. Those Dior pumps from 1992 look amazing with Stacie May’s Gatsby inspired modern take on the Afternoon cocktail dress. The 1960’s Cini of Newport beach California sterling jewelry lavalieres are a divine accessory for so many Southern California moods and events. Part of my lifestyle is recognizing that I need to add more whole foods and organic into my life as I transition to less meat and more raw fruits and vegetable. I feel so good when I eat macrobiotic, locally grown organic food. I am energized after eating versus wanting to take a nap. One restaurant near me that offers only wholesome choices is Casa De Luz in North Park offering fresh, local organic cuisine. Everything I have tried is so flavorful, clean and fresh I am constantly delighted by their innovative combinations. I am restored to see this as a growing food movement in contradiction to corporate farming and GMO spread as local fashion is to the sweat shops and corporate management of cheap, poorly made fashion. The argument designed to confuse is that all this localization costs more. It does not as it fits an equilibrium which we must strive for. I don’t need six cheap tops I need versatile quality and I can do that with local made and consignment and thrift stores to find quality vintage finds…often once made in America. 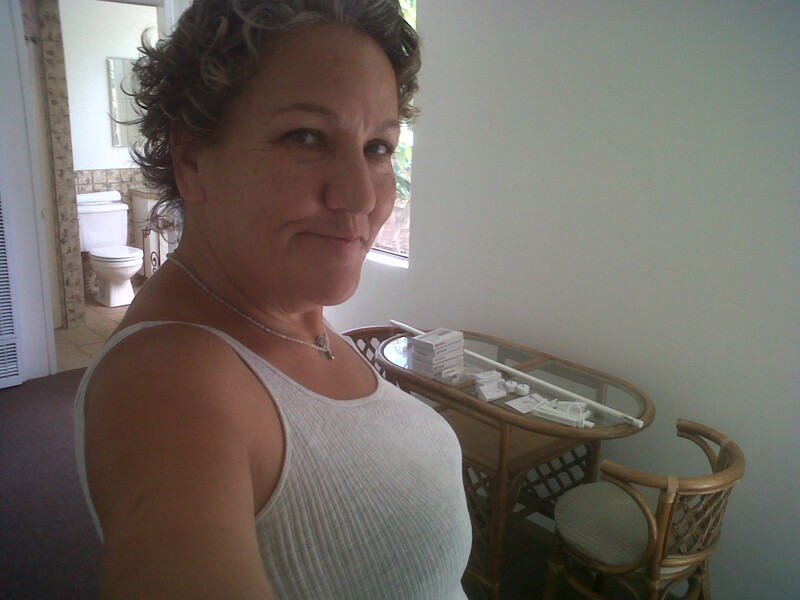 Soyez le change….I am the change in my consumer choices. Paul Rico interprets the little black dress for San Diego’s women. I check my wall board calendar and prioritize the many things which clamor for my attention. I am in the middle of creating jewelry collections for some upcoming events and appointments as well as helping my antique parents manage their lives. I am single by choice because at this point it just makes sense. I have enough on my plate and poolenty of responsibility without wondering if I am spending enough time with w partner to make them feel loved. I know many of my friends dont “get it” but, hey I rarely ask others permission before I choose my own path in life…but again I digress. So after strategically mapping out the day I get busy on the many piles from yesterday…or I go sailing. The latter not often enough, the former seem to keep growing! Challenge to buy no clothes or accessories for one year! My dear friend has challenged me to a year-long fast from purchasing new or used clothes for one year. I’m agreeing to do it until the end of 2012. She on the other hand will take the 365 challenge. In my head I’m already worrying about whether things will wear out too soon or if I have enough sweaters for fall. How ridiculous! I have more than enough of everything. I will put more shoes into daily circulation so that my favorites will last longer. I will certainly think longer before I throw things in the toss pile for the remainer of the year and I will free up even more time which previously was spent shopping for the next great running or boating shoe. I am mentally inventorying my clothes and although I have a near dozen pair of jeans only two pair currently fit and one pair of shorts in three fit. Luckily I have four skirts which fit well and more for a more svelte version of myself waiting in the wings. I can see now that having three sizes of clothes in my closet adds to the clutter and confusion of what to wear each day. After enjoying my daughter’s cooking for a month I have moved up to the top end of my wardrobe size. I am readjusting my eating style and how often now and should be back to my middle ground very shortly as summer always means more swimming and hiking and walking the parks. So in this way I will add to my wardrobe by changing size. One dilemma solved. I can see here where this may also involve doing more conscious wardrobe rotation as well to maximize the already available choices. Creativity will be put to the test. It is amazing how much time is spent shopping when we all commonly complain we don’t have enough hours in the days to do everything. Cutting out this one thing, depending on how much time one spends shopping now could translate into time for meditation, yoga, a workout at the gym or even more time for a hobby or reading. It occurs to me that a clothing fast and TV fast could nicely go hand in hand. Cut out the triggers and feel better about yourself just as you are. 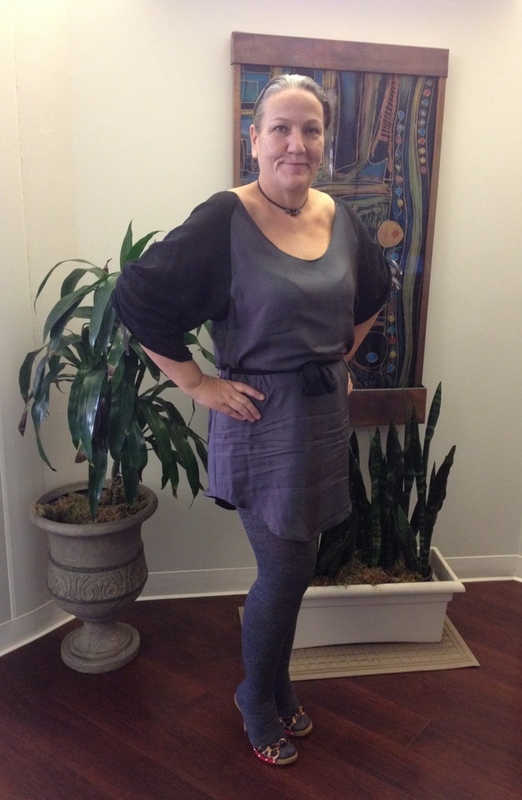 When Asta suggested this challenge to me I wasn’t sure what it would entail being called a fashion fast…I was imagining wearing things which were from a few seasons ago, contrasting colors and even mixing prints to stay out of the fashion freeway fast lane. Oh wait a minute that’s how I dress now! I wear what I like regardless of what season it is from. We call that style. I never did get a pair of open toed woven fold over ankle boots on a platform heel…oh wait those are so out no one even will admit they were even in! I have classic heels in a few styles from black slingbacks a kitten heel sandal, a stiletto strappy snake skin pair and a pair of platform espadrilles. A flat pair of pointy toe Mary Janes while living in France at a sale and a pair of embroidered black suede Spanish boots. Leather flip flops and a pair of flat white espadrilles as well as my red Sole Rebels and my white leather boat sneakers…gee when you start writing out some of them it sounds like a lot…maybe I already have too many shoes I don’t regularly wear. Maybe it is time to wear everything and cull the herd a bit. I got rid of several pairs last year and the recipients were very happy to get them so it may be time to think about doing it again in time for the Really Really free market. Some of my beautiful heels might result in a sprained ankle if I try to wear them these days while I tote Munchie the 95lb Bulldog around town and try to wear them on a sailboat. I think this comes down to re-evaluating who I am and my lifestyle rather than thinking of them as memories. This may prove to be an interesting time ahead in this challenge. By getting these items in play I am forced to confront their deeper value in my life. A couple of years ago I got rid of clothes given to me by previous boyfriends as way to free myself of my past and live more in the present. The last tee shirt I gave away a few months ago to a sweet neighbor. It said “Taken” and it seemed like it was time to pass it on and she loves it. She is a young woman who is single and currently traveling the US with family this summer working state fairs. That shirt just might come in handy…it did for me although I think that with Munchie around I don’t need the shirt to stay single, but look taken. Then we have what I call the trade professional clothes which in my case are for public appearances and special events. These are the silk skirts, fitted and dirndl in fabrics too nice to wear daily. Problem is, my life is more about wiping wet hands on my jeans while stone cutting than circulating at trade shows with buyers in an ankle length washed silk skirt and linen top. So I can see where an edited usable wardrobe of those finer items needs to be available but maybe in smaller quantities. It had been suggested these could be dating clothes now but, I like adventure dates and often wear just a tee shirt and skirt over my swimsuit in the summer for errands on my way home from the beach. So it will indeed be an interesting challenge for more reasons than just the obvious….wish me bon chance!